"In this talk, Guillaume reveals the strategies and tactics that have resulted in incredible growth in leads, revenue and conversion rates for their business. Hear from the mastermind of growth himself, how he was able to gain predictability to their revenue by staying laser focused on their buyer experience. 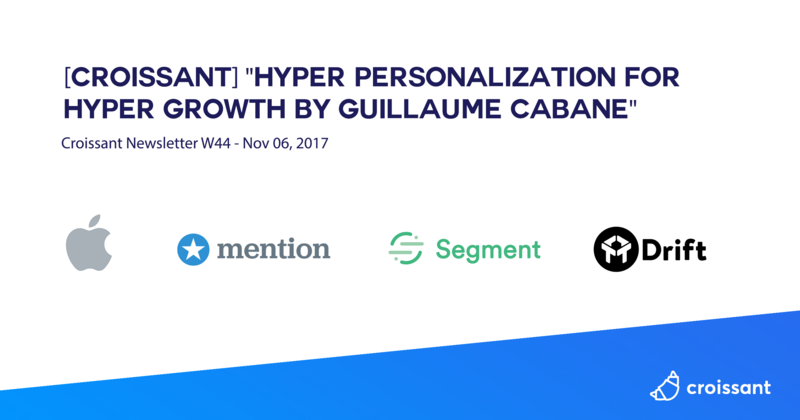 If you're a growth focussed B2B SaaS marketer you won't want to miss this!Guillaume is the VP of Growth at Drift. Prior to joining Drift he was VP of Growth at Segment and Head of Growth at Mention. In addition to other marketing roles at French companies, Guillaume spent 6 years at Apple as the Business Development Manager for Europe Online B2B." "Chinese restaurant ordering giant Meituan-Dianping recently raised $4B at a $30B valuation, making it the 5th most valuable unicorn in the world (and the 3rd most valuable in China). In this 5-min read, we’ll look at the techniques that Meituan-Dianping used to overcome growth and monetization challenges faced by peers in the US, including Yelp, Groupon, and others. Key Growth Lessons: 1. Reviews are a traffic acquisition engine, while deals monetize. 2. Dominate neighboring verticals, then use that distribution and infrastructure firepower to expand into more distant bets." "Onboarding is both the most difficult and ultimately most rewarding part of the funnel to improve to increase a company’s growth. And it’s where most companies fall short. By focusing on your onboarding, you can delight users more often and be more confident exposing your product to more people. [There are 3] principles of successful onboarding: #1: Get to product value as fast as possible — but not faster #2: Remove all friction that distracts the user from experiencing product value Retention is driven by a maniacal focus on the core product experience. #3: Don’t be afraid to educate contextually"
"Sujan Patel has made a career out of unlocking growth opportunities through marketing. A co-founder of the growth marketing agency Web Profits, he’s led digital marketing strategy for Salesforce, Mint, Intuit, Expedia, LinkedIn, Zillow and more. Plus, Sujan is growing his own handful of SaaS companies through Ramp Ventures, where he’s a managing partner. And while much of his growth work is happening behind the scenes, he’s shared many of his strategies through 100 Days of Growth (which has sold close to 45,000 copies to date), as well as his blog. Sujan recently joined me on our podcast to dispel the misconceptions around a growth marketer’s work, when a startup is ready to grow this way, why it’s important to start small, and much more." "I actually think content measurement's like one of the hardest things that has not been solved, and I've been looking for tools and things for years. And you know, in media you have obvious things like page views and time on site, but I think the number one question is you have to really tie it to what you're trying to do. And I know that sounds like a really obvious thing, but actually people don't stop to pause and ask themselves: what are we trying to measure and why?" - Sonal Chokshi Editorial partner at a16z. "And I think people tend to think social in terms of social media, sharing, as this marketing word. But actually what you care about is that it's creating conversations around your content. And as a writer, editor, a strategist, whatever your jobs is, you care about that conversation and where it's going. And there's opportunities in some of the misunderstandings, the disagreements." - Camille Ricketts, Head of Content and Marketing at First Round Capital. "“How in the world,” Yvette said, reaching for the cream cheese, “am I going to inform my team that our entire approach to marketing is wrong?” The CEO of another company, overhearing Yvette, chimed in. “Right? I just texted my VP of sales that the way we’re selling is obsolete.” In fact, virtually every CEO, sales exec, and marketing VP in attendance seemed suddenly overwhelmed by an urgent desire to change the way they worked. The reason? They had just been on the receiving end of the best sales pitch I’ve seen all year. #5. Present your best evidence"
"In today’s market, we’re seeing three versions of CMOs: The Old Fashioned CMO — who remains focused on traditional marketing and public relations tactics to help shape the brand’s perception. The Modern CMO — who is called on to use both the right brain and left brain: not only the creative elements of brand and PR, but increasingly, analytic prowess to leverage data and measure how every marketing dollar tracks back to revenue. The Next Generation CMO — who I call the Growth CMO. While this role also requires both creativity and analytical thinking, the Growth CMO must also demonstrate another critical characteristic: a growth mindset. The Growth CMO knows how to use both data and creativity to drive growth — and therefore, to step up and step in as second in command. A Case for CMOs (or CMGOs) to Be Second in Command"